The Harriman State Park continues to improve. The Tricos are in full swing and I have noticed Honey Ants around the Wood Road 16 area. These bright warm days however are not making anything easy. The large trout seem to be up early and then again late. It’s also been a windy summer so that is not helping. I arrived at the log jam at 6:30 Am on Saturday morning and walked down to Bone Fish Flats. Bone Fish is a little less than a mile from the upper parking lot or “log Jam”. As I predicted there was not much in the way of insect activity as the morning chill was still on the water but I wanted to be down there to see when things got going. It was hands down one of the best days I have had on the Ranch and the fishing was secondary. I watched and listened to cow elk make their way back into the timber, a young spike elk did his best bugle and even looked a bit confused as to why the ladies paid no mind. Two bald eagles where perched not far from where I sat. I listened to what sounded like a pack of 50 coyotes howling in the timber, in reality I’ am sure it was probably just two coyotes but it sounded like hell was coming unstuck! I stated seeing Caddis in good numbers around 7:30 AM and about 8:00 the Tricos started going shortly thereafter. It wasn’t until about 9:00 in the morning that I began to see fish eating on top and as always they were very selective. I did manage to get a eat and a couple of refusals, as the sun continued to climb it just shut down. Grand Hoppers in a #8 and #20 female Tricos should get some attention in the park. I would also have the usual beetles in sizes #14 thru#20 also don’t forget a few # 16 Lawson’s Honey ants. I would also have some #6 Moorish Tan Hoppers. 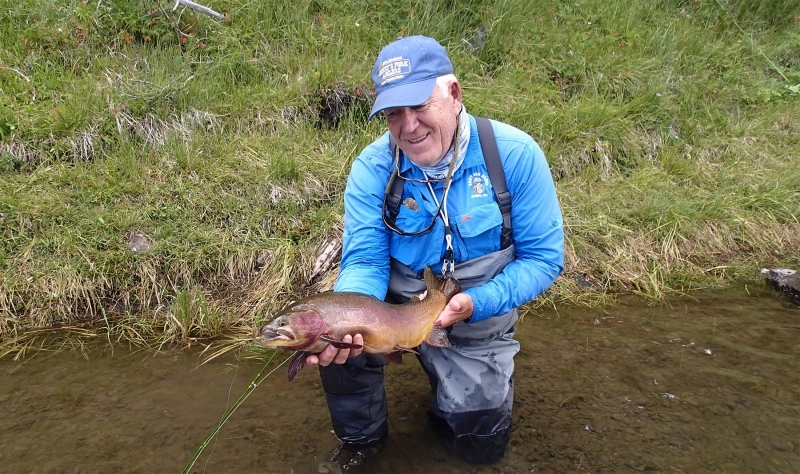 Yes the fishing in the ranch is tough and there is lots of talk and finger pointing going on but I remain positive as I have seen more young smaller fish in the ranch this year than I have seen in a while. 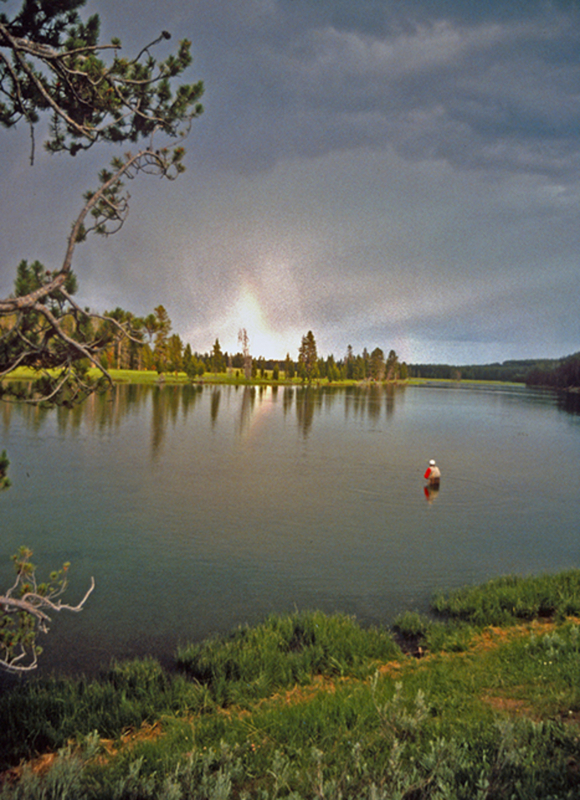 As always land your fish quick and save hero shots for times when cooler water temps won’t stress these gifts that the Henry’s Fork continues to provide. 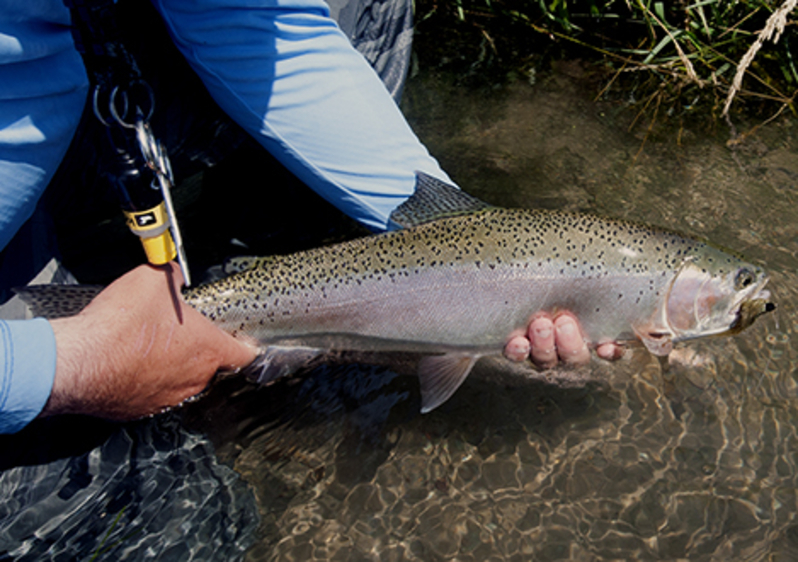 The lower river continues to fish well in the Morning and Evenings. Consistent hatches of Caddis are still the spot light. I think sometimes I sound like a broken record when I talk about caddis but these are amazing insects and a very important food source of these trout. Read Gary Lafontaine’s Caddis Flies for more insight on the subject. I would also have #14 Brown Zebra Midges and #16 Red Lighting bugs. Get them down deep this time of the year. #16 and #18 Hi-Vis Spinners for both mornings and evenings. Don’t forget some streamers. We have had a few good days fishing with Olive Zonkers. Also if you’re down there in the mornings have Trico Spinners with you. 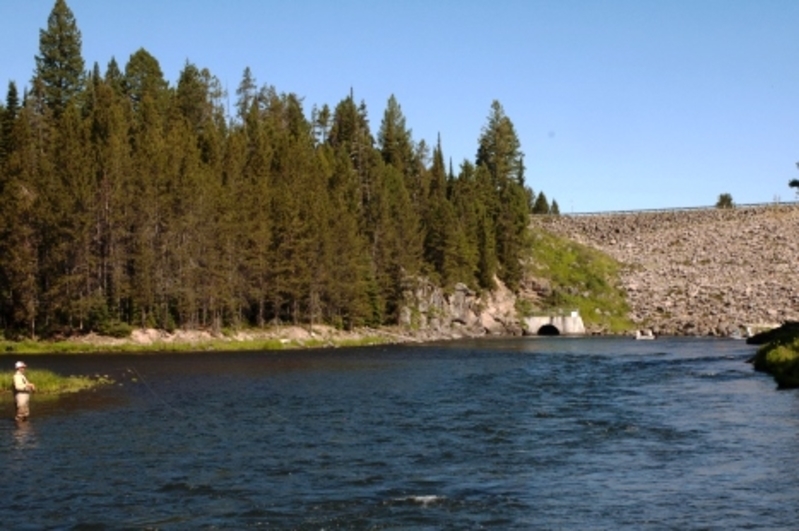 Look for rising fish in slower back water areas of the Henry’s Fork. 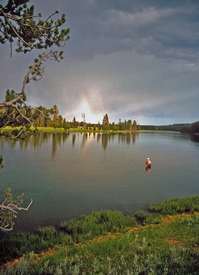 One of my favorite places to fish the Teton continues to fish well. Water levels have dropped but it continues to fish. The weekends have the added challenge of tubes and wake boards and while we have noticed that larger fish are being caught early in the Morning and then again in the evenings. Look for Pmds in the morning. #16 No hackles and #16 Hackle Stackers will work well. You will need to go deep later in the day. #18 Two Bit Hookers and #10 Black Rubber Legs will do the trick. Not much new to report on the Maddy. I think it has been an amazing year for dry flies over on the Madison. I had the pleasure of fishing with my friend Anne Brennan and we went between the lakes. The evening was by far the best. Lots of Caddis and Pmds and fish were rising. Also some larger browns the closer I got to Quake Lake. We did well with a #10 Rainey’s Hopper and also caught a few trout with a #16 Prince Nymph. The Park continues to fish but again the bright hot days are not helping. I would say the fire hole is really not an option but the Madison in the park is always worth a look. I really do like fishing soft hackles on the Madison this time of the year. If you can be there early in the morning I would fish Lawson’s Spent Partridge Caddis. Look for rising fish, if a Caddis will not get them to come up then a try a #16 Hi-Vis Rusty Spinner. Hoppers are also a good idea with a small dropper nymphs. #18 Two Bit Hookers and #18 Red Zebra Midges should do the trick. 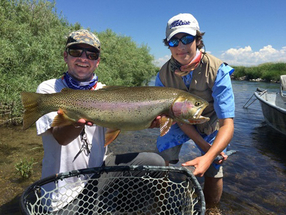 Watch for Green Drakes on the Yellowstone River. There is not much to add on the lakes from last week’s report. Hebgen continues to have great Callibaetis but you have to beat the wind! Henry’s Lake has been tough but again a handful of leeches in different colors should get some attention. Be on Henry’s first thing in the morning and use good judgement and get off the water when the wind gets whipping. You don’t want to be on the lake when those big waves start.